Grate the ginger, leaving peel on. 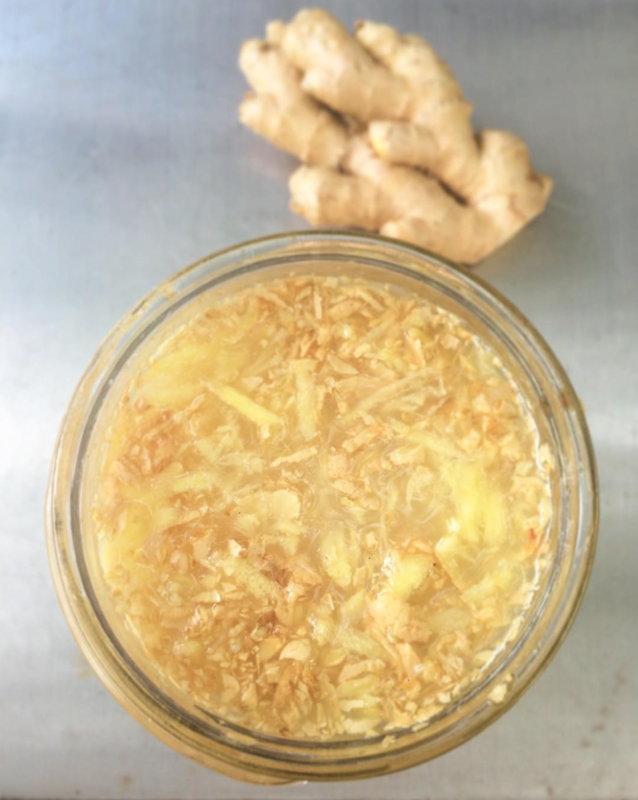 In a half pint jar, mix ginger, sugar and water. Loosely top with a lid. Allow to ferment on the counter top for up to a week until the mixture becomes bubbly. Your bug is ready to use, or may be refrigerated for up to a week. Wash the ginger and lime. Grate ginger with the peel on. Strip the peel from the lime with a peeler, then juice, discarding pith and seeds. In a saucepan, bring water to a boil and add the grated ginger and lime zest. Simmer on medium low for 15 minutes. Strain and add the sugar to dissolve. Cool to room temperature. When the mixture is cool, add the entire ginger bug to the ginger liquid, along with the lime juice and place in a glass jar. Top off with water, if needed, until there is 1 inch of headroom in the jar. Cover the jar with cheesecloth fastened with a rubber band or string. Allow the mixture to ferment for about 5-7 days until bubbly. Once bubbly, strain the mixture through a fine sieve or several layers of cheesecloth, then place in a bail topped bottle or plastic soda bottle to ferment for a few days more at room temperature. Careful not to over carbonate! After a couple days, test it to see if the mixture is bubbly. Once carbonated, refrigerate immediately. It’s best to consume home fermented ginger ale within one to two weeks or it may become mildly alchoholic.